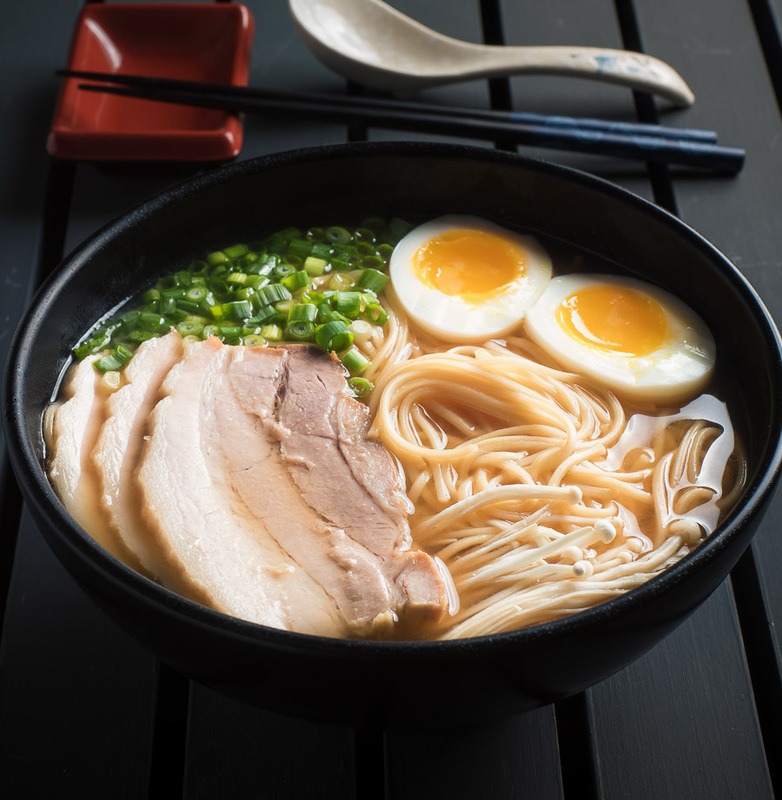 Miso ramen with chashu pork is one of the world’s great noodle dishes. Up there with pad thai, laksa, and pho. And this is an easier way to make it. Big pork broth flavour without the big pork broth effort. This is more approachable version of miso ramen. One anyone can make. And it doesn’t take 2 days. Sometimes you just can’t wait 2 days for soup. 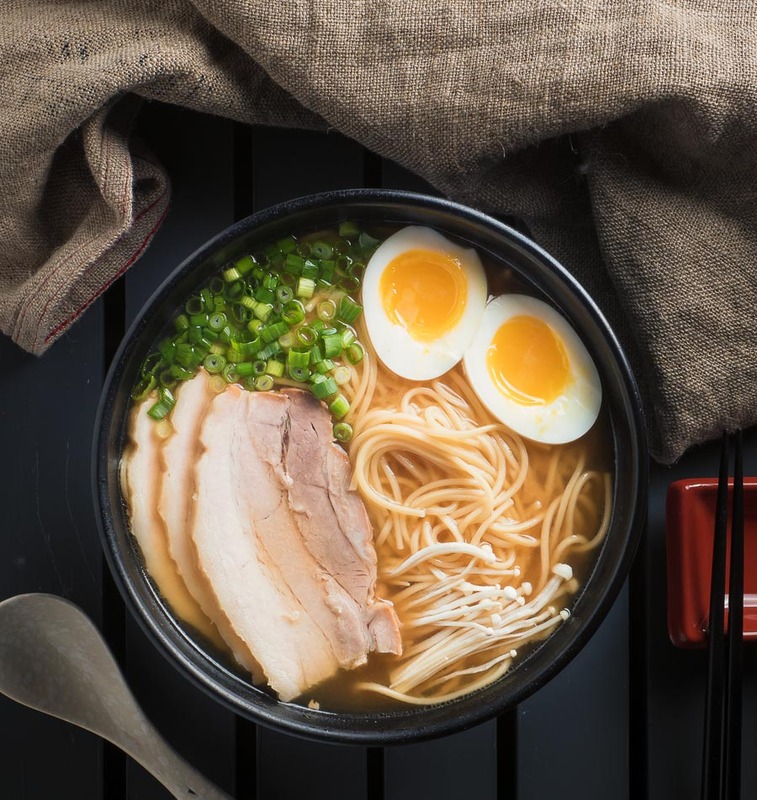 The Japanese have taken miso ramen to almost mythical status. Real miso ramen is an incredible experience. If you ever get to Japan, seek it out. On the surface it seems so simple. Noodle soup. A little pork belly. An egg. But as with many things Japanese, it is not easy. Every ingredient is perfect going in. And when it all comes together. Wow. I like perfect. Who doesn’t? But perfect is hard. I don’t always have time for perfect. And that’s what this miso ramen recipe is about. It’s way closer than the run of the mill recipes out there. Way better. It’s really good. But it’s not quite the “I’m pulling out all the stops and spending the whole weekend making a bowl of soup” perfect. 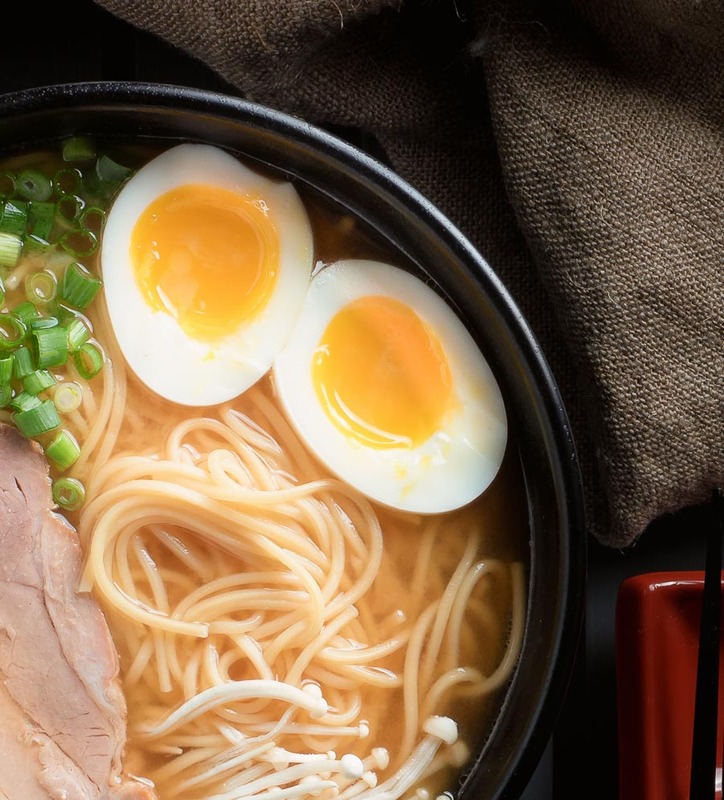 If you want to go all the way with ramen, it’s awesome. Read about it here. It’s for the truly dedicated. That’s a nice way of saying crazy like me. But if you want to go there it’s worth it. So worth it. This recipe is about building pork flavour. Start by braising pork belly. The braising liquid becomes flavour base. Bacon jacks up the flavour base. Layer on layer on layer. It’s not true tonkatsu but it does have big pork taste. And that’s a huge part of miso ramen. This is miso ramen for the rational. For the sane. For those that have not yet received their Level Three OCD cooking badge. 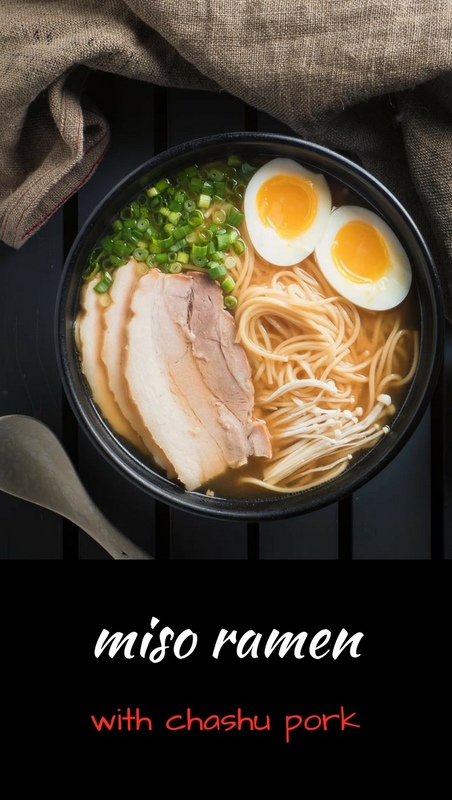 It’s for those that have to have a ramen fix but don’t have 2 days to make it. Until you go all the way, this one is going to wind up on the short list of your favourite ramen recipes. You can make great ramen at home. It doesn't have to be crazy difficult. You can do almost all the prep ahead of time. It comes together fast when it's time to serve. Pre-heat your oven to 290F. Combine the soy, mirin, sake and sugar. Place the pork belly in a baking dish that's not too much bigger than the pork belly. I use a loaf pan. Pour the soy mixture over the pork and cover the baking dish with tin foil. You want to get it fairly well sealed. Place the pork in the pre-heated oven and cook, turning the dish occasionally to ensure even cooking. You are going for an internal temperature of 195F. This will take about 2 hours. When you hit 195F remove the pork from the marinade and chill. Cool the marinade down and skim and discard the fat from the surface. This is going to be the base of your ramen broth flavouring. In a medium saucepan, bring water to a boil. Boil large eggs for 6 minutes 30 seconds. If using extra large eggs boil them for 7 minutes 30 seconds. You may have to adjust your times slightly depending on the exact size of your eggs but this should get you pretty close. Submerge the eggs in really cold or ice water to chill. This stops the egg yolks from continuing to set up. Peel and set aside. They will warm up in the broth. Combine the chashu braising liquid with 1/2 cup shiro miso in a small sauce pan over medium low heat. Warm the chashu miso mixture, mixing the miso gently. It will go in as a 1/2 cup lump so you are trying to get it to gradually dissolve. Add the bacon and simmer, covered, over the lowest heat for 1 hour. Keep an eye on it. You may need to add a bit of chicken stock to thin it out a bit. You want to wind up with about the same amount of miso tare that you started with. Remove and discard the bacon. Cook the noodles per the instructions on the package. If the instructions are in Japanese 4 minutes is about right for the thin ramen noodles. Drain and set aside. Don't let them sit too long. Try to time it so the noodles are ready when you are ready to assemble the ramen bowls. Heat the chicken broth to a simmer. Using your sharpest thin knife cut the eggs in half lengthwise. They will be a bit runny inside so be ready. Slice the pork belly. You want it about 3/16 inches thick. Warm it in the chicken broth briefly. Add about 4 Tbsp miso tare to each of 4 pre-warmed bowls. Then add 2 cups of chicken stock to each bowl. Stir and taste. You will want to add a bit more tare. You are going for the point where you are not quite sure if it's too salty. That's when it's perfect. This should be around 5 Tbsp but really this is up to your taste. It will probably be less if you used regular sodium soy sauce or there was sodium in your chicken broth. Add the noodles, then add the pork belly, egg, and enoki mushrooms. Garnish with green onions and serve. No sodium chicken stock and low sodium soy are important in this recipe. You want the salt to come from the miso tare. If you use full sodium stock and soy you won't be able to add enough tare before your miso ramen becomes too salty. In japanese, main course, noodles. Bookmark the permalink.